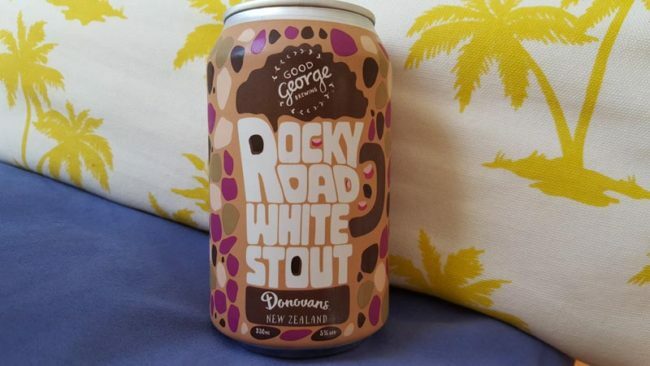 When it was first announced that Hamilton craft brewery Good George and chocolate maker Donovans were teaming up to produce a pair of rocky road stouts, I couldn’t be more excited – rocky road rocks! Then the beer was released, and it seemed like the word on the street was decidedly negative. Apparently both beers were duds, according to the beer geeks I know, so it was with some apprehension that I finally picked up the set this weekend at a random Liquorland on Auckland’s North Shore. Blurb on the can: There’s a reason why rocky road is always the first thing to disappear at birthday parties. Chocolate, vanilla, raspberry – it’s all the world’s greatest flavours in one godly mashup. The only way you could possibly improve it is by adding beer as well. That’s what we’ve done in this outrageous collaboration with Hamilton choc-heroes Donovans. We’ve brewed two versions, so try the black stout too and you’ll be partying like it’s your birthday. Tastes like: I’m going to have to find some new beer geeks to hang out with, because this beer is delicious. It’s certainly odd, but interesting, with a strong aroma of raspberry and vanilla. However, I couldn’t detect any chocolate – by nose or tongue. It was all sweet raspberry and smooth vanilla bean to me, with perhaps just a hint of coffee in the finish. But it’s not too syrupy or saccharine, as I was expecting a rocky road beer to be. Instead, it’s relatively dry, medium-bodied, and it seems to linger on the old taste buds, rather than completely assault them with a full-on rush of rocky road goodness. The verdict: Good George’s Rocky Road White Stout is an enjoyable experimental brew that won’t be for everyone – beer snobs, purists, and stuffy CAMRA members need not apply – but I liked it quite a bit, actually. It’s like a birthday party in my mouth. I’m looking forward to trying the black rocky road stout now (keep an eye out for that review in the coming weeks).